Happy New Year, everyone! On this first day of the year, I want to cover a very basic, a very important fact. I am one of four children; two sons of Adam, two daughters of Eve, four children of loving parents. Our mother has always proudly said that, no matter how old we grow, we would always be her “babies,” which is a great relief, especially when calamity strikes…and it did, when I was driving the family van as a teenager, and I proceeded to run into a car waiting to make a left-hand turn…while it could have been a much worse collision, was still fearing for my life, not because of the police officer approaching, but because of the wrath I was expecting when I returned home. Did I write my last will? Twas then I realized, there was still hope, before I faced the justice of my father, I would seek the clemency of my mother…for, when she looks into our faces, she sees the little ones from years ago, who naturally take after their parents…and I was counting on that very truth while returning home, may Mon’s face be the first that I see! Mary’s face was likely the first that the young child Jesus saw on that first night of his birth, as she in turn looked upon his in loving adoration…for 2,000 years, it’s been an astonishing truth, the face of Jesus, the face of God, which shall shine upon us and be gracious to us, blessing us for all eternity, can now be seen, can now be encountered…it’s a face, a human face, which takes after His Mother! What a great relief…if I were to approach God in all His Power, then I’d be a little scared, as when approaching Dad when I was in trouble. But, when I approached Mon, there was hope, fear dissipated, peace was found…and so, with so many ways to come, God chose to come to us, through a Mother…consequently, we can now approach God Himself, we can run without fear, we follow the shepherds to have an encounter that will change us forever and give us new direction…and encounter with a little face that looks a lot like his mother! The message of the angels was worth the energetic response – notice that the shepherds were not necessarily amazed by the angels themselves, but by their message, of a child, who is laying in peace next to His Mother. Few things cause us to have joy, wonder, or simply smile as when we see a mother with her child. No wonder God chose to come into the world this way, for He doesn’t bring fear and trembling, but rather the joy and wonder of a little baby, a little baby which has made us children of God as well, through His Gentle Mother! A mother’s love is like an island in life, ocean vast and wide, a peaceful, quiet shelter from the restless, rising tide. A mother’s love is like a fortress and we seek protection there when the waves of tribulation seem to drown us in despair. A mother’s love is a sanctuary where our soul can find sweet rest from the struggle and the tension of life’s fast and futile quest. A mother’s love is like a tower rising far above the crowd, and her smile is like the sunshine breaking through a threatening cloud. A mother’s love is like a beacon burning bright with Faith and Prayer, and through the changing scenes of life we can find a haven there. For a mother’s love is fashioned after God’s enduring love, it is endless and unfailing like the love of Him above. We hear these beautiful words…fortress…tower…peace…very similar words to the titles used for the Mother of Jesus. 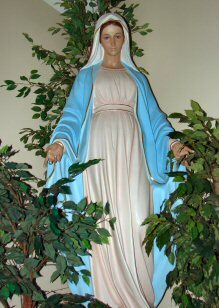 For Mary herself is called the Queen of Peace, the Tower of Ivory, the House of God. Perhaps all of her titles are best brought together through the title of Mother. Her vocation to holiness was through being a mother. She was immaculately conceived, to be a mother. She was assumed into Heaven, because she was a mother. God’s Mother! And, like my mother, like our pastor’s mother, like all our mothers, Mary kept all things in her heart, for in her heart, Jesus is still her little boy. We each pass through time, for one moment to the next, but for a mother, everything is present before her, as she reflects upon her children. As such, each mother imitates God Himself, who lives beyond time, in the beauty of Eternity reflecting upon each child of His in His infinite heart. Mary always kept her Son in her immaculate heart, from the moment of His conception to his final moments upon the cross, as he called out to her and gave her away…to be our mother as well. She continues to keep her Son in her heart…but now, she keeps us there as well! She certainly is, for each of us, and so we are given a reminder at the beginning of this year, to courageously run with joy in sharing this amazing encounter with God, who now has a human name, who now has a human face, who now has a mother who is ours as well. What's the best way to draw close to our Almighty Lord and God, or to help others to draw close to him? What's the best way to do anything? With Mom's help! Dearest of Moms, dearest of Mothers, in your immaculate heart, keep us sinners, your children, close to your Son always, now and at the hour of our death. Amen.